The blessing given to boys is Jacob’s blessing to Joseph’s sons, Ephraim and Menashe. Jacob declared: “By you shall Israel bless, saying: May God make you as Ephraim and as Menashe” (Genesis 48:20). Jacob’s children were raised and taught by Jacob and their mothers, all of whom were devoted to the service of God. Ephraim and Menashe, on the other hand, were raised in Egypt and were taught their faith by Joseph and their mother, Osnat (a presumed convert to monotheism). They lived, however, in Pharaoh’s palace, hardly an easy place to escape from the amoral practices of the ancient Egyptians. When Jacob finally came to Egypt, he was delighted to find that his grandsons’ “Jewish souls” had not only survived in the exile of Egypt, they had actually flourished. Perhaps anticipating that many future generations of Jews would be raised in environments similar to Egypt rather than the land of Israel, Jacob’s blessing to his descendants of the future was that, wherever their homes may be, they too should be able to create strong Jewish families in which Jewish faith and heritage would flourish. The Matriarchs--Sarah, Rebecca, Rachel and Leah--were raised in homes and environments filled with idol worship and immorality. (Laban, the father of Leah and Rachel, was a well-known thief and con-artist.) Nevertheless, the Matriarchs used the force of their personalities and spiritual inclinations to live righteous lives set apart from falsehood and idolatry. Additionally, examining the lives of the Matriarchs can teach us much about prayer, patience and gratitude. These women were each outstanding individuals, possessing extraordinary personal integrity and strength. By blessing our daughters in their names, we teach our daughters to learn from them and to emulate their lifestyles. Twebrew School: Shabbat is brought to you on behalf of Shabbat Across America and Shabbat Across Canada, the only cross-continental celebration of Shabbat. The fourteenth annual SAA/C will take place on March 5, 2010. To learn more, click here. 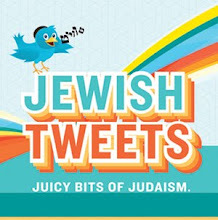 Copyright © 2010 National Jewish Outreach Program. All rights reserved. Are you are looking for our Twebrew School Instructional Video Lessons? You can find them archived here. Are you interested solely in reading our interesting facts about the letters of the Aleph-Bet and general knowledge of the Hebrew Language? You can find those posts archived here. 1. Receive our Twebrew School Treat emails where we share daily Hebrew words of wisdom. 2. Twebrew School Light (we'll send you a book corresponding to our Twebrew School Instructional Videos). 3. Attend a Twebrew School Tweet Up. You can choose one or all three by clicking here! You have a great opportunity to meet your Twitter friends and followers in real life by helping us coordinate a Twebrew School Tweet-up in your community. Remember, if you can read, you can teach! Fill out our intake form here! Who Lights The Shabbat Candles?